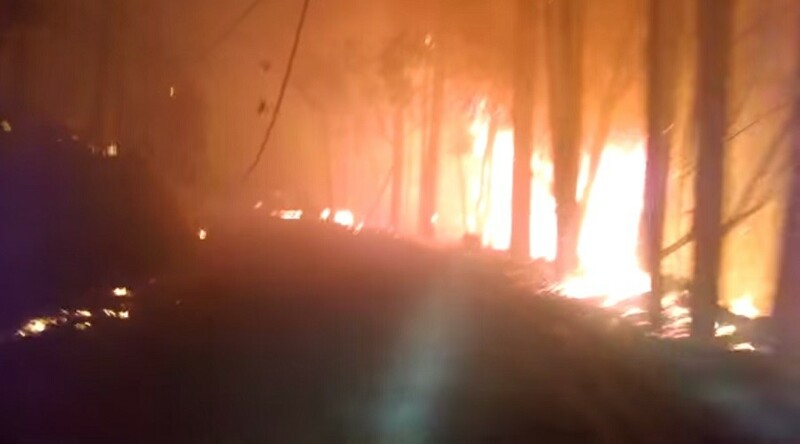 As the catastrophic Valley Fire spread through Lake County, California, one YouTube user recorded his daring escape from his home down apocalyptic roads flanked by blazing pines. During the series of videos, he defied death on his way to safety. The inferno ripped through 50,000 acres in just 36 hours, destroying as many as 1,000 homes and forcing more than 19,000 residents to flee the area. On Saturday night, with no warning, YouTube user mulletFive, realized he and his wife had to escape. He captured three videos of their harrowing flight to safety out of Anderson Springs. “We are the last house at the very back of the Springs, down in a gulch. There was no smoke or ash coming our way, and there were no sirens or air support nearby, so we honestly didn't know how close it was,” mulletFive wrote in a YouTube comment. “Once we drove up out of our gulch, we realized how close it was. There were no sirens or air support because there was zero firefighting effort in Anderson Springs,” he added. On Sunday, the inferno was still 0 percent contained, and one person was reported dead due to the Valley Fire. MulletFive wrote that he thought that most of the houses he passed during his dangerous drive would have been consumed by fire. He and his wife are waiting to receive the all-clear to go back home to inspect the damage, but he expects that to be several more days. "I am in the Bay Area waiting for the roads to reopen, and as soon as they do I will shoot video driving around the Springs and post it ASAP,” he wrote Sunday evening. As of 8 a.m. local time on Monday, the fire was 5 percent contained and it had burned through 61,000 acres. “Hundreds of homes and hundreds of other structures destroyed,” the California Department of Forestry and Fire Protection noted on its website.